Welcome to our new on-line shop! If you can't find what you are looking for, try the search box above or send us an enquiry. We're adding new products all the time and we can supply almost any spare part for almost any brand. Below are some categories for you to begin browsing, just <b>click the heading</b> of whichever one interests you most. Enjoy! This is where you'll find everything speaker related. From horns, tweeters and diaphragms to woofers, sub bass and mid range drivers, from 5" to 18" and beyond. We've also got re-cone kits and crossover parts as well as complete crossover modules. 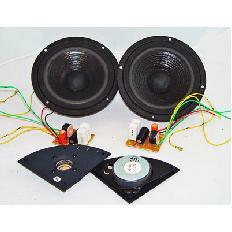 All our speaker parts are sourced as OEM items. This means that if you order a tweeter for a KRK Rokit 8G2, we will be supplying you with the exact tweeter, sourced directly from KRK systems. This applies to the entire stock. We do not support spurious suppliers and we insist on the original item to the exact specification of the manufacturer. We achieve this by buying our stock directly from each respective product manufacturer rather than from a generic speaker manufacturer. The Optical Pickup area is where we keep all the lasers. From Minidisc to CD, CDROM and CDR lasers to Minidisk Magnetic Heads and related items, you'll find what you need in this section if you're working with digital optics. All our lasers are sourced as OEM items. This means that if you order a laser for a Tascam MD-801R, we will be supplying you with the exact laser, sourced directly from Tascam. This applies to the entire stock. We do not support spurious suppliers and we insist on the original item to the exact specification of the manufacturer. We achieve this by buying our stock directly from each respective product manufacturer rather than from a generic laser / optical pickup manufacturer. The fader bank is where you can browse our wide selection of professional audio faders. From 100mm motorised and manual line faders to compact 60mm types and DJ mixing desk cross faders to FX and group faders of all sorts, you will find all popular values, profiles and types here. 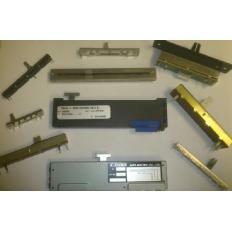 All our faders are sourced as OEM items. This means that if you order a fader for a Mackie mixing desk, we will be supplying you with the exact switch, sourced directly from Loud Technologies. This applies to the entire stock. We do not support spurious suppliers and we insist on the original item to the exact specification of the manufacturer. We achieve this by buying our stock directly from each respective product manufacturer rather than from a generic fader manufacturer. Replace that missing knob or fader cap that's always catching your eye and make your equipment look great again. 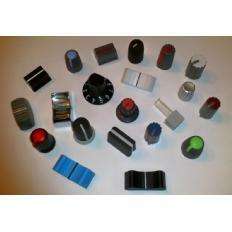 We have all shapes and sizes, all colours and all types of control caps for t-bar, t and other fader types. Also, to suit all diameter and length of shafts on potentiometers or encoders. Here you can browse our wide selection of professional switches. From tact, micro, rotary, slide and multi-pole switches to right angle, rocker and latching or momentary switches, we have them all. 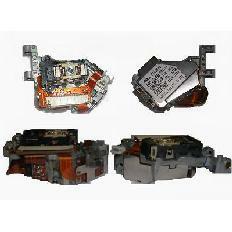 All our switches are sourced as OEM items. This means that if you order a switch for a Focusrite ISA828, we will be supplying you with the exact switch, sourced directly from Focusrite. This applies to the entire stock. We do not support spurious suppliers and we insist on the original item to the exact specification of the manufacturer. We achieve this by buying our stock directly from each respective product manufacturer rather than from a generic switch manufacturer. Sometimes circuit boards become corroded or physically broken. Sometimes the faulty part is just not available on its own. In these circumstances, a component level repair is not an possibility and we can sometimes find that board replacement is the only option. In the case of some switch mode power supplies, while a repair is often possible, sometimes it's as quick and cost effective to fit a new SMPSU module, so in these cases we can supply the comlete power supply as a module for DIY installation. As with every aspect of our on-line shop, we have not yet listed every possible item, so if you are looking for something that isn't listed here, please ask us as we'll either have it or we'll be able to get it for you. 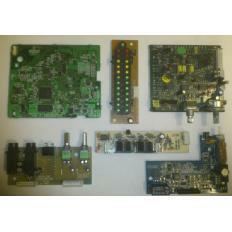 All printed circuit boards we supply are supplied as brand new and OEM in origin. Nearly everything has a screen these days and they are often unique, custom designs. 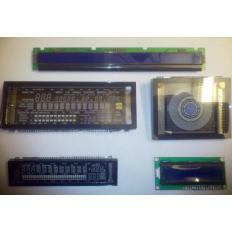 We can source and supply almost any display module for almost any professional audio product. Here we list the most popular ones but as we keep saying, if it's not here, please ask as we can get it for you. From on-air playout machines to nightclub DJ CD and MP3 players, we have access to original manufacturer spare parts. From guitar effects units, compressors and pre-amps etc. If it has a display that's died, we can supply a brand new one for you. Regardless of the product, from stage pianos to usb controllers with screens, they are all available and we can supply them at the best prices around. Just ask if the display you need isn't listed. From a needle to an anchor as the well known saying goes! 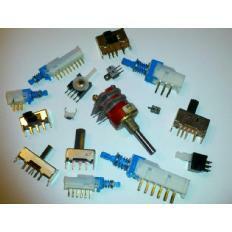 Here we have a myriad of electronic components for all kinds of professional audio equipment. If you are in a position to carry out your own repairs, this is the place to source original spare parts and components. 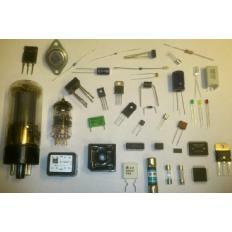 From bridge rectifiers, capacitors, diodes and resistors to fuses, transistors, I.C's and relays, we have them all. We've also got a range of valves (tubes) from power valves as used in amplification output stages to signal valves used in microphone preamps and other compressors and effects units. As usual, please note that we can supply almost any component, so what is listed here is by no means the extent of our arsenal. So, if you are looking for ANYTHING, just ask us. We'll usually surprise you with a YES.